Self contained modern apartment,Absolute beach access, with unrestricted surf and beach views. Apart from this property shown here (descriptions below). The Beach House is family run with, 1 & 2 bedroom self-contained accommodation most with 180-degree beach and park views, some with garden views, but all only 5 minutes or less walk to the beach. TV and DVD. Some with full kitchen some with kitchenette. Washing machine. Check out the surf each morning. FOR YOUR ADDED SECURITY, this, and our other properties are all FAMILY OWNED, my name is Nicky Kierath and I live in North Curl Curl, our properties are all in North Curl Curl . WE NEVER REQUEST PAYMENTS TO BE MADE TO OVERSEAS BANK ACCOUNTS. ***please note we have a minimum stay of 7 nights unless it is "last minute" and available or it fits in with existing bookings. IN ADDITION TO THE ABOVE APARTMENT WE HAVE OTHER SEPARATE BEACH APARTMENTS VARYING IN SIZE AND VIEWS. WE MAY NOT FILL OUT THE AVAILABILITY CALENDAR AS IF WE CAN'T HELP YOU WITH ONE WE WILL TELL YOU ABOUT ANY OTHER AVAILABILITY WE HAVE. Activities within walking distance include surfing, swimming, tennis, dining, cliff top walks, parks and fishing. Under five minutes drive away you can enjoy a huge shopping mall, movies, fine restaurants, golf and much more. My name is Nicky Kierath, I have lived in Robertson Road North Curl Curl since 1998. I have been renting out self contained holiday accommodation in NCC for well over 20 years, firstly in my parents house in Surf Road NCC. My sister Joanna Jankaus has been my business partner ever since she moved to Surf Road from Canberra in about 2003, when we created our own web syte. We have great reviews from our guests from all over the world. My parents moved to Surf Road North Curl Curl in about 1984, so we always LOVED to come over to visit them from Lane Cove, until eventually we also moved here!!. We are just above North Curl Curl Beach, with breathtaking views down the beach to Manly and can even see the top of centrepoint tower in the city. North Curl Curl is a very popular surf beach. My husband and I stayed in Apartment (2) in North Curl Curl belonging to the Beach Houses Sydney web site group. 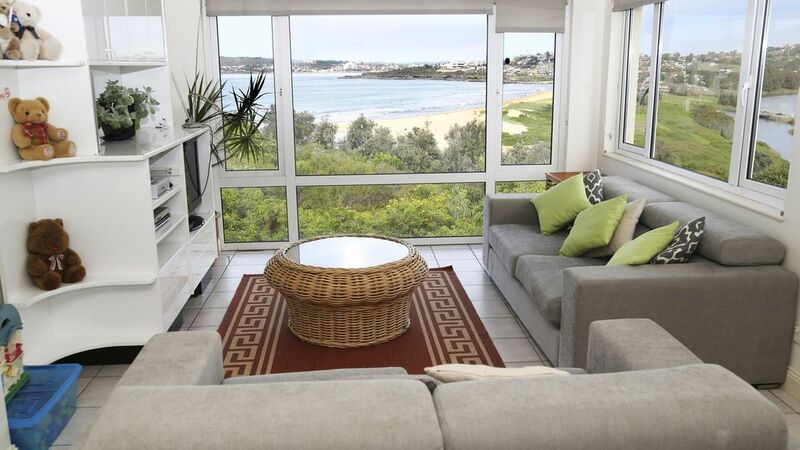 It is located on the ground floor in a quiet and pretty garden setting with direct views of Curl Curl beach. It is a spacious apartment cared for by the on-site owners who made us very welcome and helped us with valuable advice on local places and restaurants. It is situated just a few minutes from the resort of Dee Why where you can find restaurants with beautiful ocean views and offering cuisine from around the world. There is easy parking, lots of lovely coastal walks and a coffee shop just a few minutes away. You really cannot do better. We feel we would happily go back and have come away knowing we could not have chosen a better site or a better place . Great hosts who really want to ensure you have the best stay possible. Fantastic views from Apartment 2 right across Curl Curl Beach down to Manly. We spent a day in the City and used public transport which is just a short walk away to Bus 136 that takes you to the Manly ferry . There is an amazing cliff walk up to Dee Why with some nice spots for budding photographers. Easy beach access, we were also lucky to see a pod of dolphins surfing the waves while we were there. We will be looking to spend some future holidays back in Curl Curl. Highly recommend Aprt 4, Robertson Rd. The view is incredible. We had a two week stay over the Christmas period & found the apartment excellent. Nicky, the host was very helpful. It was perfect to check out the surf & beach conditions from the windows & so convenient to the attractions of the Northern Beaches. We'll be back! We stayed at both Ap 4 Robertson Road and Carrington Parade for approximately 2 months from September to November. Nicky is a friendly, helpful host for whom nothing is too much trouble. The apartments were both fantastic - Ap4 is spacious with incredible views and easy access to the beach. Carrington was even closer to the beach and had everything we needed. Curl Curl was a great base - peaceful and relaxed but only a short trip away from Manly or shopping at Warringah Mall or Dee Why. Thanks Nicky, we had a wonderful time and it was a great welcome to Sydney! property was large and clean, views excellent - all-in-all it was a very pleasent stay Thank you! The property was extremely comfortable, well appointed and clean. It is a good size for two couples, and provides a good base for exploring the Northern Beaches. Would definitely consider booking for a second stay.